R.I.P Stan Lee and be comforted in the knowledge that your legions of fans and your works of art will endure for a long time to come. I can’t think of a better way to honor Mr. Lee as this film embodies everything we could want. This month the comic book world was dealt a heavy blow when we lost a legend, the "Godfather of Superheroes", Mr. Stan Lee. He created so many incredible characters that have endeared and changed over time. I can think of no more fitting tribute to his legacy than Marvel Studios' latest animated feature, Spider-Man: Into the Spider-verse. After seeing this movie, I can only imagine the film is one Lee would have been proud of to serve as a vision of what he set out to accomplish all those years ago. This Spider-Man blends the past with the present and gives a peek at the future allowing the audience to fondly remember what came before while offering a view of what is yet to be. Miles Morales (Shameik Moore; Dope) is an average teenager living in New York City. He leaves home Monday morning and returns Friday night to attend a Science and Engineering High School and lives in a small dorm room during the week. He idolizes Spider-Man much to his police officer father's chagrin, who regards the webbed superhero as a menace. Miles sneaks out of his dorm room sometimes to visit his Uncle Aaron (Mahershala Ali; Moonlight). Pretty much your normal, everyday kind of stuff. However, on one of his unauthorized visits to his Uncle, he sees Spider-Man pursuing bad guy Wilson Fisk (Live Schreiber; Spotlight) who has created a Super Collider that Spider-Man knows will destroy the world. As Spider-Man attempts to stop Fisk he ends up dying and Miles is crushed. At the same time, Miles seems to have been bitten by a radioactive spider and wakes up the next morning to find he has new "powers". Meanwhile, this Collider had opened different dimensions and now various iterations of the superhero are trapped in Miles' world. He and the rest of the "spider-people" have to figure out a way for them to all get back to their own dimensions and destroy the collider so Fisk can't harm anyone. The vocal talent in this film is one part of what makes it great. Moore offers a streetwise sentiment that makes Miles real. Jake Johnson (New Girl) voices Peter Parker from another dimension while Chris Pine (Star Trek Beyond) has a small cameo as the Spider-Man Miles watches die. Schreiber excels as the evil villain (isn't that redundant?) and Ali offers his deep voice as the uncle Miles looks up to. Rounding out the cast is Hailee Steinfeld (Pitch Perfect II), Lily Tomlin (I Heart Huckabees) and Zoe Kravitz (Divergent). The animation is unlike anything you have probably seen before. Much of it is in the same vein as old newsprint and it is incredible how they blended various types of drawing ranging from the traditional to anime to graffiti and everything in between. The colors jump off the screen at you and move by so quickly sometimes that you hardly realize you are seeing varying shades and hues. However, these shadings are what give the picture its depth and definition. The story is also one of the gems of the movie as it is unique and interesting without being to cliché. The viewer can hardly be bored as the plot moves along nicely. It is great the way the writers include different versions of Spider-Man, allowing those of us that are a little older to appreciate how far the webbed hero has come and how long he has been around. It is also terrific the way they incorporate modern themes and ideas into the movie offering young adults a different perspective on the character. Spider-Man: Into the Spider-verse does for comic books and superheroes what Hamilton: The Musical does for Broadway. They both bring in a new audience that would otherwise probably not be exposed to superheroes or musical theater and give them a character they can relate to. R.I.P Stan Lee and be comforted in the knowledge that your legions of fans and your works of art will endure for a long time to come. I can't think of a better way to honor Mr. Lee as this film embodies everything we could want. 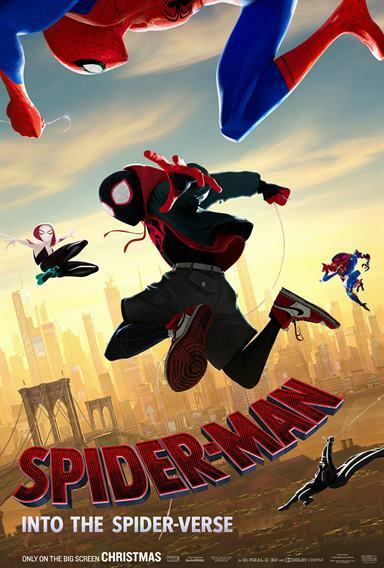 Download Spider-Man: Into The Spider-Verse from the iTunes Store in Digial HD. For more information about Spider-Man: Into The Spider-Verse visit the FlickDirect Movie Database.